A woman in rural Rwanda tends a fire with a sampling probe above it during emission testing by the Grieshop Lab. Photo Credit: W. Champion. Click to enlarge. Editor’s Note: This is a guest post by Andrew Grieshop, an assistant professor of civil, construction and environmental engineering at NC State and co-principal investigator of a project aimed at addressing energy poverty in southern Africa, which is funded by the NSF’s Partnerships for International Research and Education (PIRE). 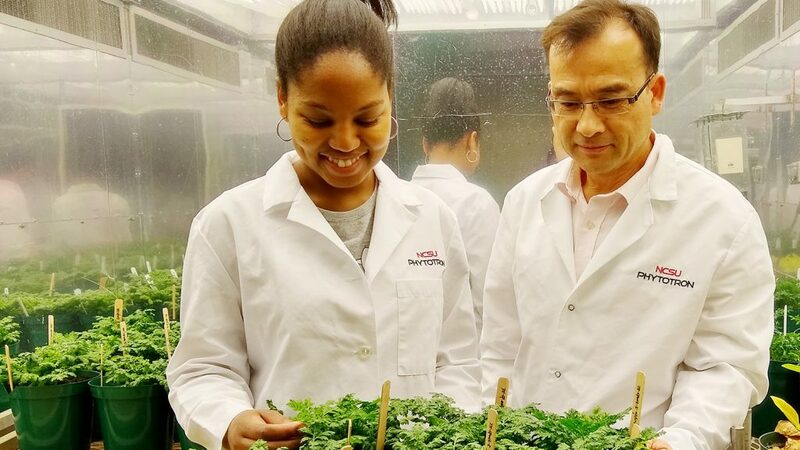 In our ongoing Research Matters series, NC State researchers address the value of science, technology, engineering and mathematics. Imagine cooking on a campfire. In your kitchen. In the dark. That’s the daily reality for billions of people, including hundreds of millions in sub-Saharan Africa alone – and it’s a problem. When I’m doing field work, I routinely have to crouch to avoid collapsing in a coughing heap or have my eyes tear up. But many women and children spend hours a day in these settings. And while the nighttime stars in rural Africa are stunning, human activity is limited once the sun sets in areas where the lack of electricity means lighting is limited to expensive flashlights and sooty kerosene lamps. This lack of access to the reliable power that most people in the U.S. take for granted is termed “energy poverty,” and I am part of a team that is studying efforts to address it, to better understand how successful efforts can best be expanded, and to build a network of African and U.S.-based researchers that can tackle this problem now and into the future. Our program is called the Energy Poverty PIRE in Southern Africa (EPPSA), and we’re funded by the NSF’s Partnerships for International Research and Education (PIRE). EPPSA involves a partnership of researchers from NC State, UNC, Research Triangle Institute, Copperbelt University (in Zambia), the Lilongwe University of Agriculture and Natural Resources (LUANAR) (in Malawi) and the University of Zimbabwe. And we’ve got our work cut out for us. Access to clean and plentiful energy is key to everything we may consider essential to our lifestyles, from clean water and lighting to the production of household goods. This is why energy is central to one of the Sustainable Development Goals (SDGs) established by the United Nations to help advance the well-being of people around the world. Specifically, SDG number 7 (of 17) is to “Ensure access to affordable, reliable, sustainable and modern energy for all.” And the need for energy is something that is woven through nearly all of the other goals. For example, I’d argue that sustainable cities, clean water and increased education are all impossible without clean and plentiful energy. As it is now, energy generation is the dominant contributor to global greenhouse gas emissions and makes huge contributions to air pollution in locations from the home to the North and South Poles. So it is essential that as we work to get people plugged into energy sources, we do it in a way that minimizes emissions of carbon dioxide and air pollutants. Energy poverty is pervasive. One-fifth of the world’s population lacks even basic access to modern electrical services, and over 3 billion people (nearly half of the global population) rely on solid fuels like wood, dung or charcoal for their household energy needs. What’s more, those living in energy poverty are almost always living in other kinds of poverty. That means addressing energy needs is complicated by a scarcity of available resources. Sub-Saharan Africa, including the countries of Malawi, Zambia and Zimbabwe, is and will be a key place to push for mitigation of energy poverty. These three countries have relatively low levels of energy access, though those levels vary. That makes these countries an ideal place to do research on what is working now and what might work best in the future. For example, fewer than 10 percent of people in Malawi, and less than 5 percent of people in Malawi’s rural areas, have access to electricity from the grid. 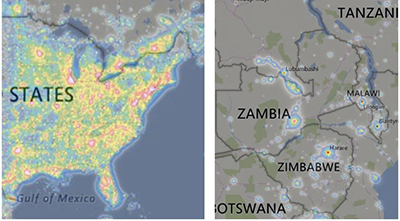 This contrasts sharply with Zimbabwe, where 80 percent of city-dwellers and over 20 percent of rural people have electricity connections. These countries have been selected as EPPSA partners because all three countries share many similarities (such as ecosystems and culture) but also have important differences (such as different levels of energy access and industrialization, economic base, and political/economic ‘trajectory’). For example, Zambia has a relatively thriving industrial base, while Zimbabwe’s once strong economy has decayed as the result of decades of corruption and withdrawal by the international community. 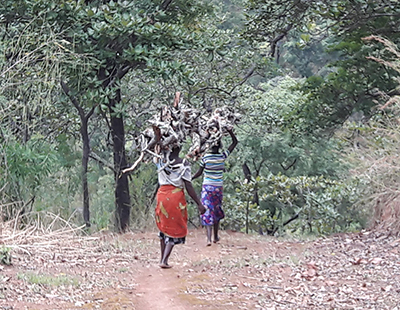 Women in rural Malawi carry “head-loads” of firewood for cooking or sale. Photo Credit: A. Grieshop. These three countries also have widely varying dependence on charcoal, which is the dominant cooking fuel in sub-Saharan African cities. So, our target countries are ones with huge and varying potential for change. These countries are also home to universities and organizations that are partnered with EPPSA and are already implementing energy projects. We will work with them both to tackle research questions and to train the next generation of African researchers who will continue the attack on energy poverty. Apart from the long-term limitations on development caused by energy poverty, it also has very immediate and deadly consequences. Air pollution from the use of solid fuels has immediate impacts on the health and well-being of billions who depend on it. In fact, recent work to tally up the contributors to early deaths around the world suggests that more than 4 million extra deaths per year occur because of exposure to indoor pollution from cookstoves. These cookstoves also release huge amounts of air pollutants that affect air quality and climate across the globe, and so have been a focus for improvement for decades. This is where my main expertise comes in, as someone who measures all kinds of air pollution in all kinds of settings. I’ve worked with various collaborators for years to help evaluate technologies (like new stoves) and programs (like funding new stoves using carbon credits) to move people toward cleaner sources of cooking energy. 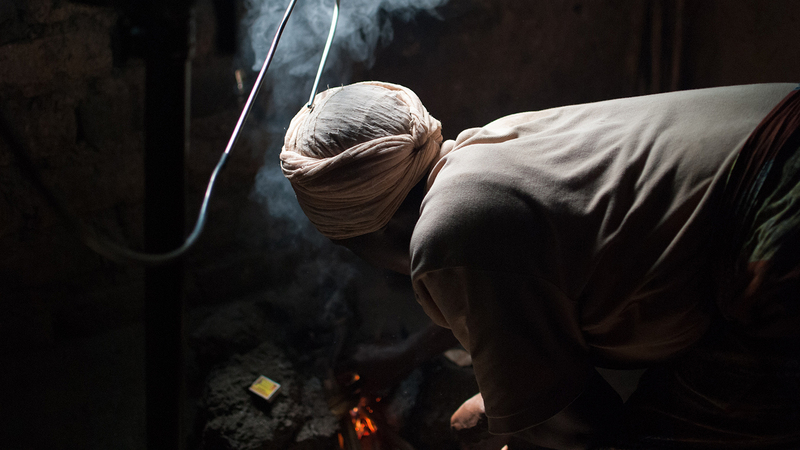 For example, one of our studies in India found that despite the best efforts of a local development organization, the stove technology they were introducing didn’t result in substantial reductions in air pollution or human exposure. This is despite the fact that the same type of stove was promoted for its efficiency and cleanliness by companies and global organizations based on laboratory testing. While this type of result is disappointing, our study provided invaluable “real-world” evidence to counter wishful claims and prevented further missed opportunities. As an engineer, I want to help solve these problems. But sometimes an important part of solving a problem is pointing out what doesn’t work. And one thing I like to do in my work is to address problems efficiently: What can we learn from a small study? How can we make sure that information is shared so that mistakes aren’t repeated? How can we use what we know to avoid mistakes, without having to do massive multi-year research studies? 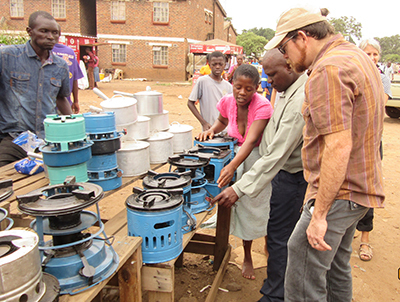 Andy Grieshop (at right) in a market in Harare, Zimbabwe, examining locally-produced stove models. Photo Credit: P. Jagger. Much of my research in this area focuses on the technology for cooking or heating. And though we have approaches (like gas or electric stoves) that we know are clean and efficient, these aren’t feasible in places saddled by energy (and resource) poverty. So there are a lot of questions about what technology can work in different settings. For example, one central question is whether to try to improve upon existing solid-fuel-based stoves or jump straight to stoves using modern energy sources like compressed gas or electricity. However, technology is only one piece of the puzzle. A new stove must be used to provide energy and cleaner air, and getting people to use new technologies requires understanding human choices and introduces even more complexity. Lots of organizations are working to address energy poverty, with various perspectives about what approach, scale and technology will work. All kinds of efforts get put into place, from every level of government and various ministries to non-governmental organizations (NGOs) and social enterprises (i.e., businesses focused on the idea of “doing well by doing good”) to conventional businesses simply out for financial returns. Working on household energy can also happen on a range of scales, from a single village to a country or region. Finally, getting people to use something is all about having a product that meets their needs but that is also affordable. But how do you do this? Subsidize? Incentivize? Build markets? Give technology away? These are not easy problems, and those of us working in this field typically have more questions than answers. This means that we need more researchers and educators to help find the best ways to address the problems. Clearly, energy poverty is not an issue that can be addressed from a single disciplinary direction, as it spans engineering, economics, public-policy analysis, environmental science, health, education, and culture. Therefore, it demands an approach that cuts across traditional academic areas to address all of these different facets. These hybrid approaches exist, but they are far from the norm, so we also need to train a new generation of researchers who can easily work across disciplinary and international boundaries. In other words, training opportunities are very important. Tackling energy poverty successfully will depend on combining the tools, abilities and experience of U.S. researchers from different disciplines with in-country academic partners who know the context and where the changes need to happen. This is precisely where EPPSA comes in. We will contribute to finding solutions for these sweeping challenges through research, and in doing so train the next generation of interdisciplinary researchers and practitioners in the U.S., and we are working with our EPPSA partners in Africa to offer similar training opportunities to African scholars. EPPSA will work to tackle energy poverty in the region from a few angles. First, it will study the problem of energy poverty from a high level, examining the way that people, societies, culture, infrastructure, and landscape affect how energy access has changed and may change in the future. This portion will be largely the work of geographers, economists and environmental scientists. The other big focus, which I will co-lead, is a “frontline” effort to study different ongoing efforts by governments, NGOs and businesses to address energy poverty. We will conduct “impact evaluations” of these efforts – measuring things like how much people use a new technology, what services (e.g. light, heat, cooking, income generation, etc.) people get from that technology, what environmental/health benefits (or impacts) result (e.g. air emissions, exposure, etc.) and how these technology-driven efforts might be scaled up in other places. It’s important to note that we are not doing the interventions ourselves. Instead, we are relying on ongoing or new efforts in Zambia, Malawi and Zimbabwe – efforts led by in-country or international groups who have learned the local contexts and are working to scale up attempts that have been successful. We will be conducting one- or two-year studies with the goal of getting rapid insights into these existing projects that we can then share with other energy poverty researchers and with those who are responsible for making relevant policy decisions at every level. Examples of projects we aim to evaluate range widely, but they are all smaller-scale – not large power plants or hydroelectric dams. Most of these projects will be at the household or community level. For example, home solar systems for lighting and charging cell phones, new fuels and stoves for biomass cooking, and household biogas systems that make cooking gas from animal and human waste. 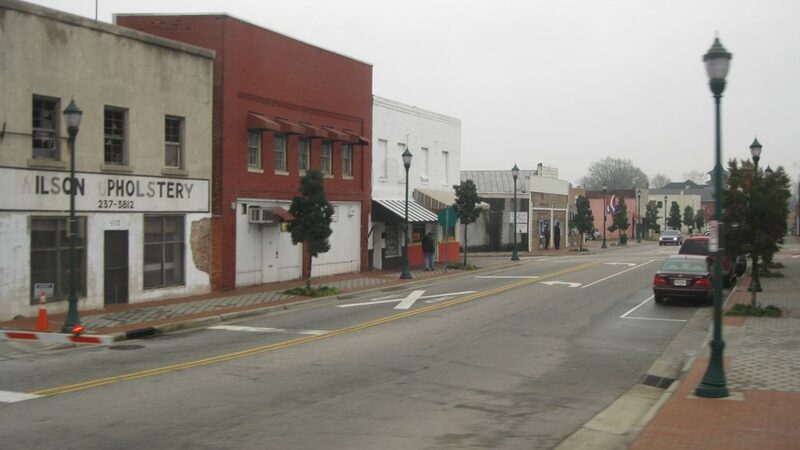 At a community level, we may study development of “microgrids” for households and small businesses in rural settings, the use of backup generators at cell phone towers to provide cooling for vaccines at rural health centers and so on. What will the work look like for me and my group? Data collection will involve multi-month field campaigns with graduate and undergraduate students from NC State and our collaborators in the U.S. and Africa. One focus area will be the use of sensors to measure the benefits and impacts of different technologies. Much of this may focus on air pollution measurements, but we won’t be limited to that. We’ll also be collaborating with social scientists who will use surveys to gather information about the people using these technologies, their circumstances, their choices, and the impact of those choices. And of course all of the data and samples we collect will need to be analyzed. A key outcome will be quickly communicating our findings to the groups (government ministries, NGOs, companies) we’re working with, so they can learn as we do. We’ll also be briefing policy makers and the larger communities interested in energy access. We want to help amplify positive impacts and redirect efforts that look like they are not heading in the right direction. The educational aspect of the project is an even more important way to make a longer-term impact. We will form a group of Energy Poverty Fellows in the U.S. who will work together, across universities, countries and programs. These fellows will get exposed to all aspects of the interventions while simultaneously building expertise in their focus area. For example, students working with me will learn about air pollution measurement, how to deploy low-cost sensing to aid in evaluation, data analysis, field work, etc. 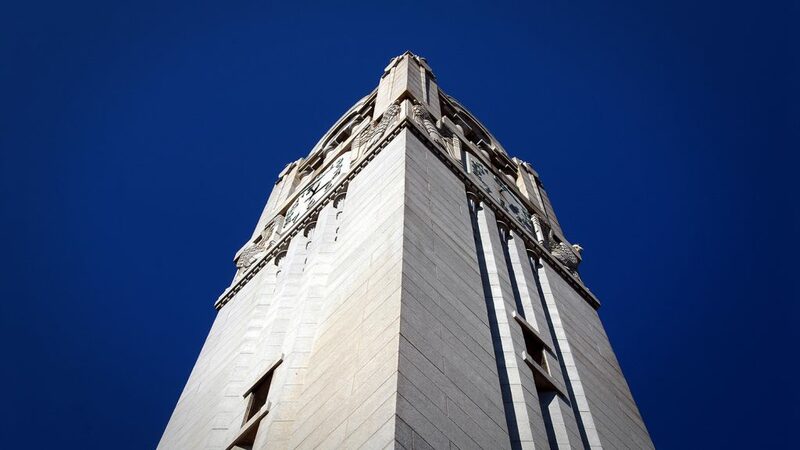 But these students will also be working with economists and geographers, giving them key insights into how different researchers address the same problem in different ways. Each group contributes, and each group benefits from the work and expertise of the other fellows. Energy makes so many essential things possible, and the gaps between the haves and have-nots only grows larger when large populations are without access, as is currently the case in large parts of Africa. Finding effective ways to address energy poverty is a global priority. Through EPPSA and my other work, the goal is to provide rapid response research to learn what works now and what can be expanded to work on a larger scale. Learning and knowledge are the near term goals, and have practical applications. But in the longer term, the new generation of researchers trained through this work will be the ones who can continue and expand this vital work to energize development. You are doing awesome work in Africa. Africa can use your expertise to craft a way out of perennial energy poverty. I’m launching a biogas plant in Zimbabwe and hope our paths will cross.